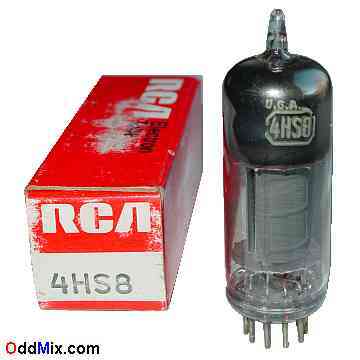 This is an original RCA 4HS8 Sharp-Cutoff Twin Pentode electronic vacuum tube. Dual pentode tubes are difficult to find yet very useful to have, difficult and expensive to make, electronic vacuum tube. This nine pin, all glass, noval type were made for early TV sets and typically used as a high gain RF or IF amplifier, oscillator, usually in class-A configuration in many instruments, radio and television (TV) receivers. Excellent part for antique radio or television restoration, circuit design or for rare tube collection. It is an NOS [New Old Stock] tube with box, unused. Only one available.